The new Dundee United striker wants to emulate Nadir Ciftci at Tannadice. Dundee United signing Darko Bodul has revealed that former Celtic and Rangers stars convinced him to move to the Premiership side. Bodul, who described himself as Austro-Croatian, signed a two-year deal with Jackie McNamara's team on Tuesday after leaving Austrian Bundesliga side SC Rheindorf Altach. The 26-year-old forward explained that a number of influences from both of Scotland's biggest clubs in his decision to move to Scotland. He said: "When I played before in Holland I knew [Georgios] Samaras and I knew [Nadir] Ciftci and I've been watching them a lot. "That's why I know Scottish football. It's changed from before. Now there are more and more young players. Faster and more technical players. "So I think that's the kind of football for me. At Dundee United I spoke to the coach a lot and I think they play the football I want." Although Bodul admits he never spoke directly to either the former or current Celtic strikers, he did get some personal advice from an old friend who used to play for Rangers. 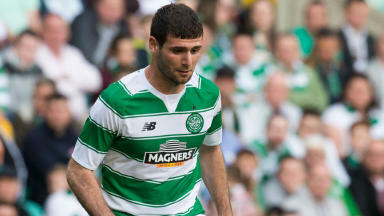 "No I didn't speak to them [Ciftci and Samaras]," said the forward. "But my brother spoke to an old friend in Bosnia. I think you all know him. He played in Glasgow before: Sasa Papac. "My brother spoke a lot with him and he gave some good advice. He told my brother that it was good for me to make the step in to Scottish football with Dundee United." The new striker is now looking towards the future, where he is hoping to make sure he quickly replaces the talent lost from Ciftci's recent departure from the club. He said: "That's what I'm hoping to do. I'll do my best to help the team. To help the club. To help myself. "At the end of the year everyone would be happier if I did that so I will go for that. I believe in my quality and I believe in the coach and this team. So together I think we'll have a good season."